When my wife, Haley, came up to me about a week ago and asked me what I’d like to do for my first Father’s Day it took me approximately a second to respond with, “Could we go to Pecan Lodge for lunch?” I explained to her that it had made Texas Monthly‘s list of the 50 Best Barbecue Joints and had gotten rave reviews with other local and national reviewers and she said ok. Little did she know that meant we also had to brave the line to get such awesome food. Today started off just like a normal day with morning feedings. After the 6:00 AM feeding we casually began loading up the car to head down to my parent’s house in Irving, about forty minutes south of us in Denton. We made it to their house at about 8:45 AM and that gave the grandparents about 30 minutes of play time before he next feeding. At 9:15 AM my dad and I left for the dreaded line since Pecan Lodge is located in shed #2 of the Dallas Farmer’s Market. We made it to downtown Dallas, parked and were at shed #2 by about 9:40 AM. I was a little surprised we could get inside because every review I had read said the building didn’t open until 10:00 AM, but we entered and began to notice the intoxicating aroma of smoked meats. We quickly found Pecan Lodge and followed the line until the end, and we estimated the line to be about 50 people deep. 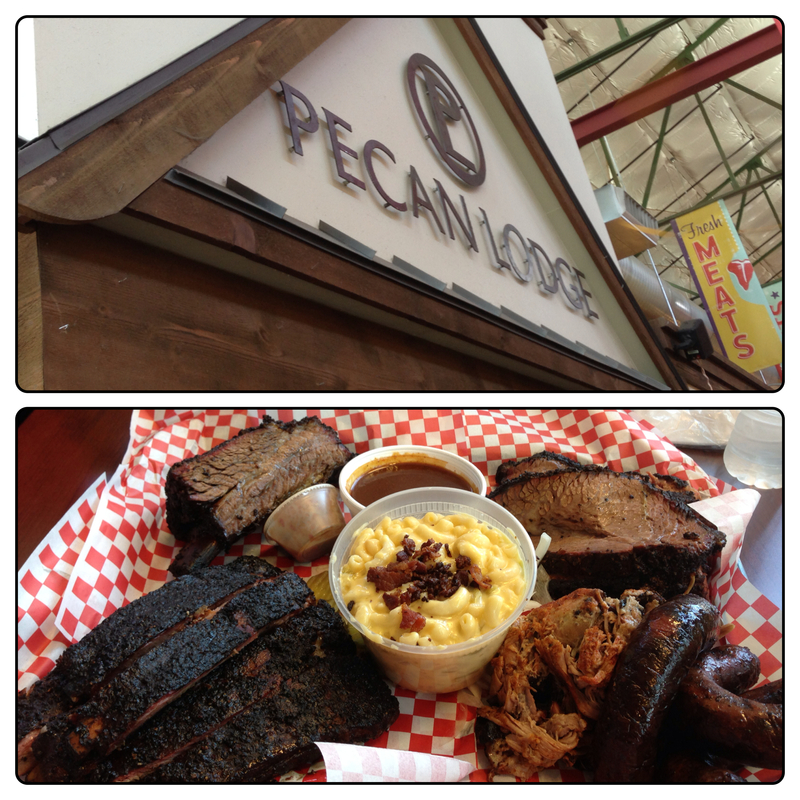 For good food that’s understandable, but Pecan Lodge didn’t even open until 11:00 AM! My father and I took turns waiting in line until my mother and Haley came around 10:30. We sent them to go save a table for us and we continued to wait in line getting hungrier and hungrier. Finally at a little after 11:00 AM we heard the dinner bell ring signaling that food was now being served (the first person in line when they open gets to ring the bell). The line inched forward one person at a time until we got to the front. We ordered “The Trough” which is the family style barbecue plate with sausage, pulled pork, pork ribs, brisket, and a beef rib as well as an order of mac and cheese (or as the sign had it labeled “crack and cheese”). As soon as we ordered they made the announcement that they were out of beef ribs…boy were we lucky! Soon thereafter, a gentleman from the back brought out our tray loaded with food (pictured above) and we got down to business. We ate to our hearts content on the tray of smoked meats and there was plenty left to take home for later. Our consensus winner was the brisket. It was thick cut, rubbed to perfection, and literally fell apart when you tried to grab some with your plastic fork. I personally was not a fan of the mac and cheese, but it was all gone by the time we left. Since our table was right out in front of Pecan Lodge, we talked with a lot of passer-bys asking us what different meats were on our tray. All this time our six week old daughter Caroline slept in her stroller, only stirring to get a bottle of milk at noon. Altogether a wonderful first trip into public with our baby girl and an outstanding first Father’s Day. On the way home, Haley and I talked smoked meats. Her father competed in barbecue competitions in the past and still to this day owns a large smoker-on-wheels trailer and Haley always said he made the best brisket she had ever tasted. She even admitted that Pecan Lodge had the best brisket she had ever tasted. I’ve had her father’s brisket and I’ve been to a handful of other places on Texas Monthly’s list (although none rated as high or higher on their list) and this was by far the best brisket I’ve ever tasted. I look forward to trying out some other places on the list, but until I find something better, Pecan Lodge sits alone at the top of my personal best barbecue I’ve ever eaten.